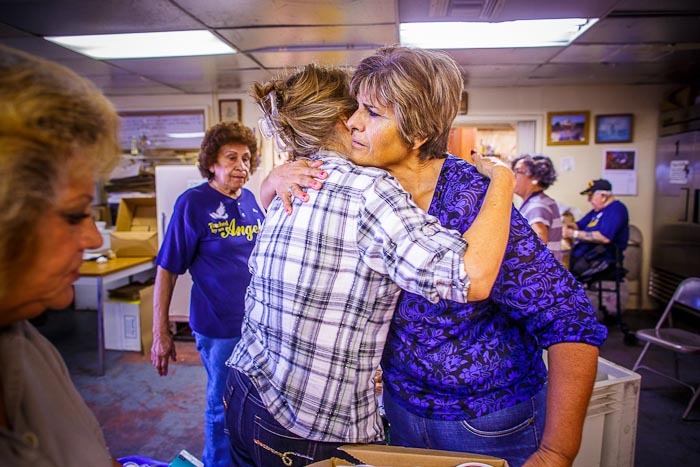 The assistant director of the Tolleson Food Bank (right) comforts a client during food distribution. More and more people are depending on the kindness of strangers. Tolleson, a suburb of Phoenix, is about 10 miles west of downtown. It was a farming community when we moved to Phoenix in 1999. Cotton and melons grew in the fields that surrounded the town. Many of the town's original inhabitants were farm workers and the center of town, the downtown area if you will, is still mostly Latino, people who were drawn to Tolleson to work the fields or in the agricultural sector. In the early 2000's, developers bought up the farms and started raising houses instead of produce. People flooded into Tolleson and bought homes they couldn't afford with money they didn't have and lent to them by bankers who didn't care. Then the crash came, foreclosures skyrocketed and people who thought they were living the dream discovered they were trapped in a nightmare. Food bank use has soared as people's situation in life has deteriorated. One volunteer at the food bank in Tolleson told me use has more than doubled in recent years. I've been photographing food banks in the Phoenix area for years. I wish didn't have to, but without the food banks many people would go hungry. And without coverage, the quiet work the food banks do would go unnoticed and they would not be able to meet their ever expanding needs. There are more photos of the Tolleson food bank in my archive.